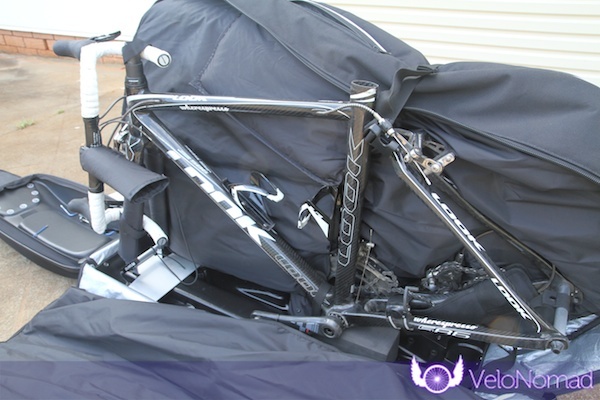 A big thanks goes to Cell Bikes who sent me the bag for this BikND Helium review for free to review, (and keep). Cell Bikes received some advertising on the website in return for providing the bag, as well as some advertising on the mailing list for a few months. If you’re an Aussie, show your appreciation for Cell’s generosity by supporting them. Since publishing this, Cell Bikes don’t stock the Helium anymore. 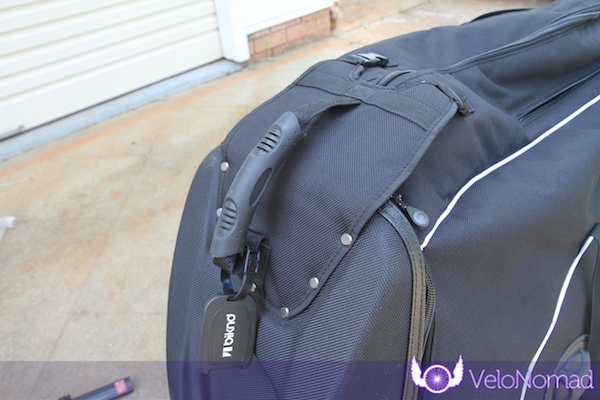 The BikND Helium is a relatively expensive bag compared to some other bike bags (like the EVOC Bike Travel Bag), but is worth it considering you’re protecting a expensive (probably) bike and given its excellent features. Would I buy the BikND Helium? Without reservation, yes. Is it worth the price premium over the Scicon AeroComfort 2 TSA (between $50-$100)? Yes (it protects the bike much better and is more robust). 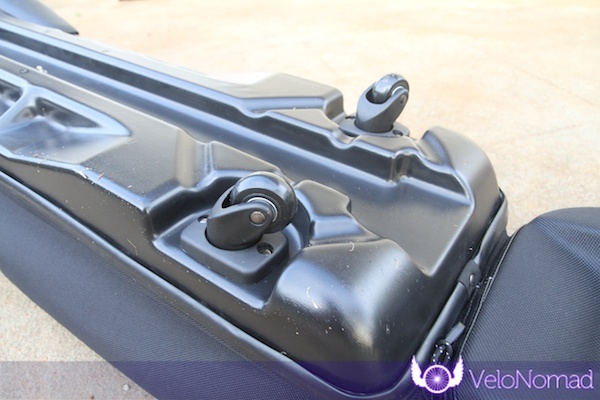 Is it worth the significant price premium over something like the EVOC Bike Travel Bag? Yes, it’s much more user friendly and compact. 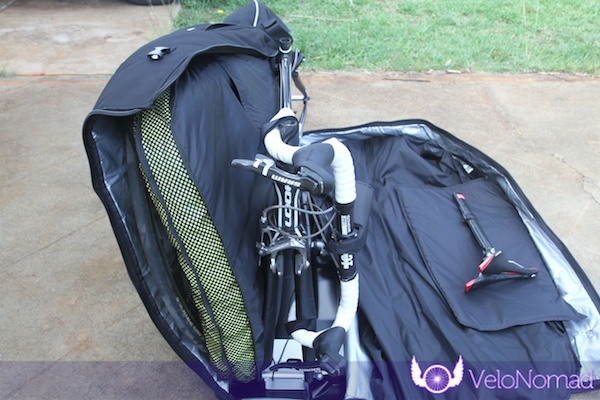 Before we dive into the review, I want to quickly mention what I look for in a bike bag. 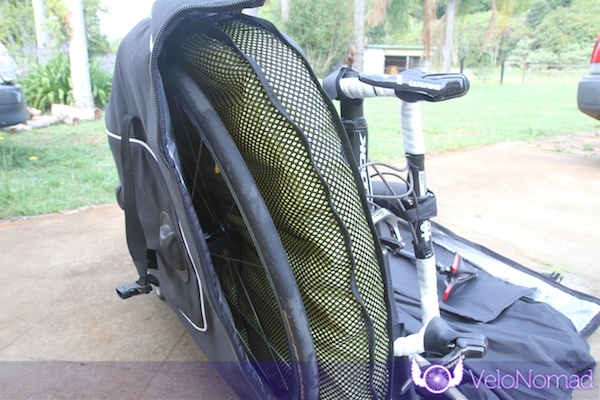 If you’ve read a VeloNomad bike bag review before, skip the next few paragraphs. All of the metrics I judge a bike bag on, except price, contribute to the overall utility and affect the user experience of the bag. Not all metrics are equal, and some of these metrics are more important that others. Obviously some of you may think some of them are not important at all. There is a downloadable spreadsheet at the end of the post so you can play around with the weightings I give each metric. 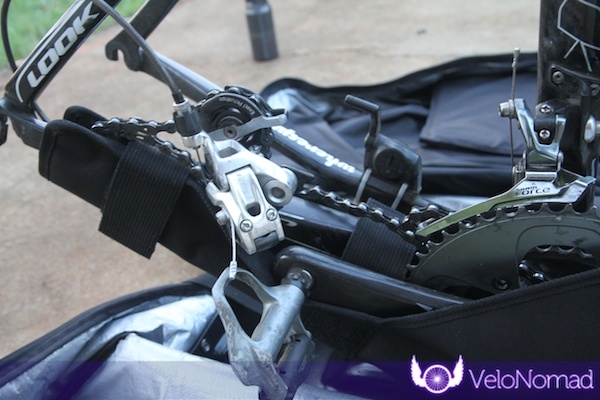 The overall score is a weighted average, not simple average, so if you apply your own weighting to each metric the scores across all bike bags in the VeloNomad coverage universe will change. Handling: how easy it is to navigate airline check-in queues etc. Basically, manoeuvrability. The bike bag ships with the following items. All are pictured throughout the post. One of the most important things I was looking out for in the BikND Helium Review was how the bag handled. Happily, the Helium is highly manoeuvrable as it has 2 front castors and 2 rear wheels. It’s not quite as manoeuvrable as the Scicon AeroComfort 2 TSA, but is close. 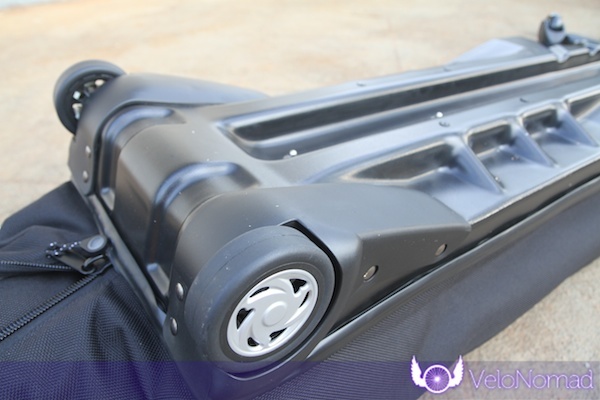 The material used in the castors are a touch soft and “sticky” so they can on occasion (on rough surfaces) stick, or require a bit of a push to re-align them in the direction you want to go. If you’re not careful how you apply this “push” the bag can start tilting. This shouldn’t be a problem in airports. This bag will excel is airport queues, particularly check-in, as well as transit and transfers. No lifting, no carrying, no dragging. 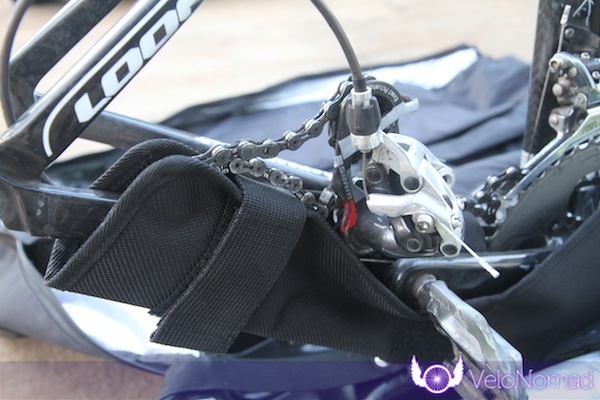 This relates to how easy and convenient it is to get your bike into and out of this bag, and set up ready to ride. I consider this important on shorter trips, for example, flying into Adelaide from within Australia, for the Tour Down Under. 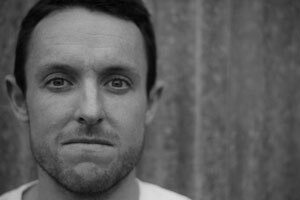 You land in the morning, arrive at the hotel, probably can’t check in, but can quickly be on the bike out to the stage. The BikND Helium Review found that the Helium is great in that regard. Here’s what I found convenient and user friendly about the BikND Helium. Take the front wheel off, put it in front skewer/fork stand. This lets you disassemble the rest of the bike very conveniently. The front protector shell conveniently holds your allen keys and other stuff. 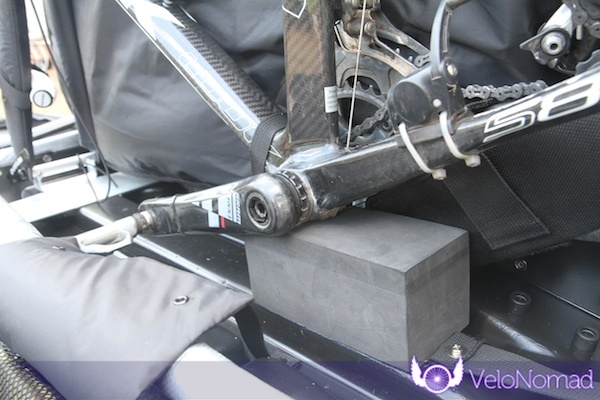 The bag is stable and the bike can be made ready whilst also standing up (unlike the EVOC, which can fall over or collapse). Packing the BikND Helium is tricky the first time – instructions are included and yes I used them. I suggest doing it in the following order. Make sure you wear surgical gloves to keep your hands clean. I needed these tools: 5mm allen key (rear D/R, yours might be different), whatever allen keys for seat, handlebars (3 and 4mm for me), pedal wrench. Obviously the order in which you unpack is whatever you prefer – reverse order makes sense to me. Front wheel off, add fork protectors, attach to front fork stand. Right pedal off, rear wheel off, crank cover on. Use tie down to secure bike down. Remove rear D/R and tape to rear stay. Remove handlebars and attach with funny little stem sleeve and supplied velcro straps. You’ll see in my photos that my bars are up quite high. This is because I use Yokozuna Reaction cables which are very stiff. 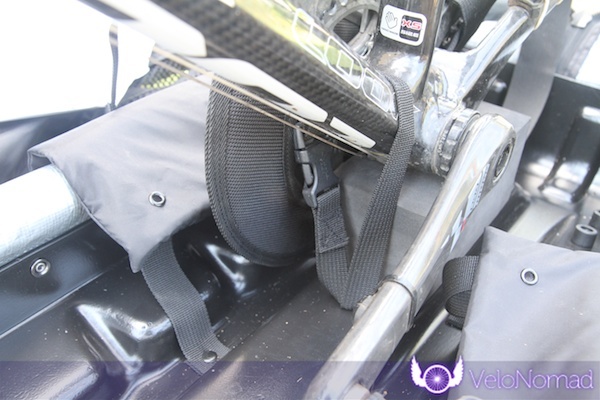 Remove seat and post – this is optional as there is a bit of room at the top of the bag. I have to remove my seat and post as my Look 586 has a non standard seat post and it does not go all the way down. Put wheels in (remove skewers). Blow up air bags – to be honest this is optional. There’s enough padding in the bag to forego this option. Zip main zip line up, zip front shell up, done. This should take you 15-20 mins depending how deft you are. With the pedals, you almost definitely need to remove the right pedal to ensure the crank cover fits properly. You can probably get away with leaving the left pedal especially if you have small form factor pedals (e.g. Speedplays). When you remove the rear D/R and fit the crankset cover make sure you fit the velcro straps below the chain to help keep the chain off the seat stay. Also consider wrapping the chain in something (not pictured below). 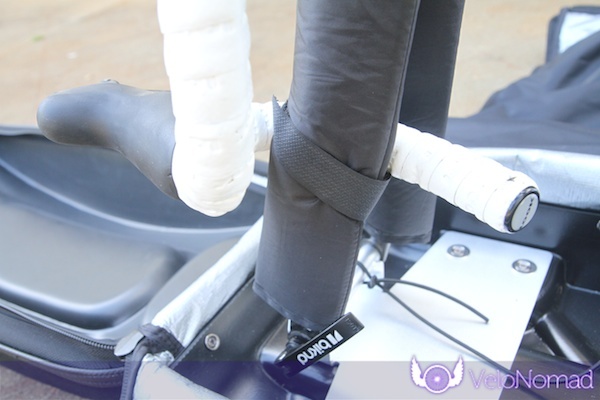 Wrap the rear D/R in bubble wrap and tape it to the rear stay by the cable. It is stable fore and aft, unlike the Scicon which can tip forward. It is a touch unstable laterally when trying to move at right angles if you push the bag midships. If you steer it from the front strap this is not a problem. The BikND packs down into a fairly small package: on par with the Scicon AeroComfort 2 TSA and smaller than the EVOC Bike Travel Bag. 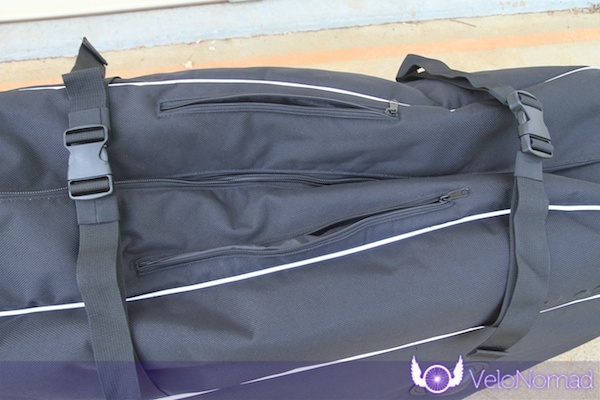 It comes supplied with a bike bag bag, and the bike bag is easy to roll up and get into the bag. 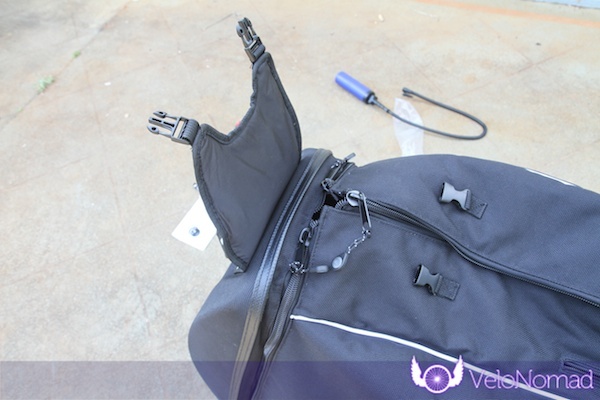 The bike bag bag also has a strap to further tighten and compress the bag. Obviously, any BikND Helium Review wouldn’t be complete without touching upon the weight and size of the bag. 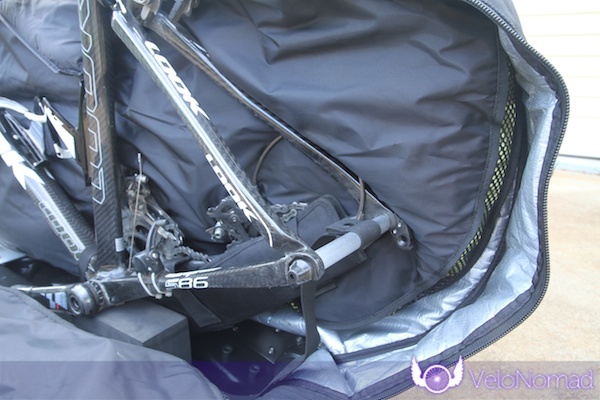 Because this is one of the most important factors in bike bag selection. This bike bag weighs 9.5kg on my scales. It is one of the lightest on the market. Because the bag isn’t huge, you could easily put it in the boot of a hire car either lying down or standing up (wagon). 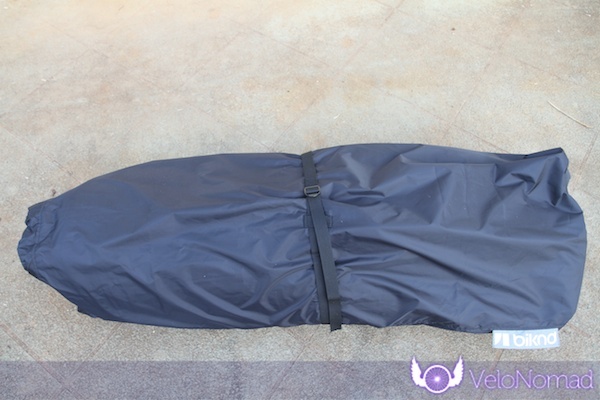 In undertaking this BikND Helium Review, I found out that this is a pretty tough bike bag. 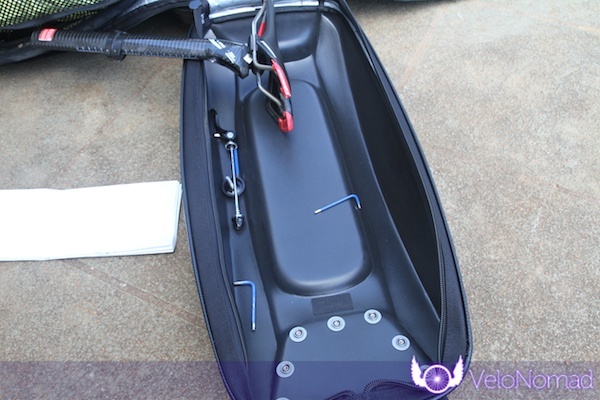 The internal material is mainly comprised of surfboard bag foil which is super tough and means you can wipe grease out easily. The external appears to be ripstop material. The base is a hard injected/preformed plastic which is awesome – no rips in the bottom of the bag. 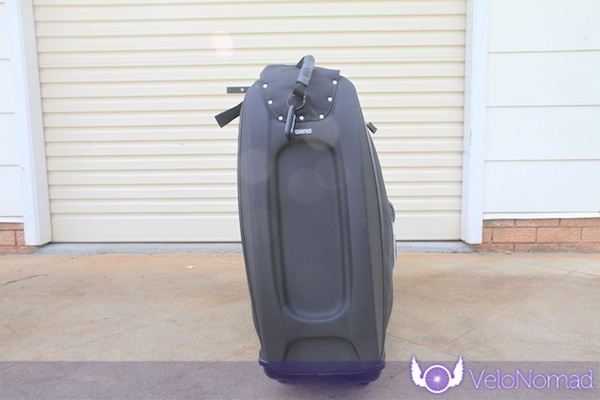 The rear wheels seem robust but are probably not to the same level as the skateboard-like urethane wheels on the Dakine Split Roller luggage bag. 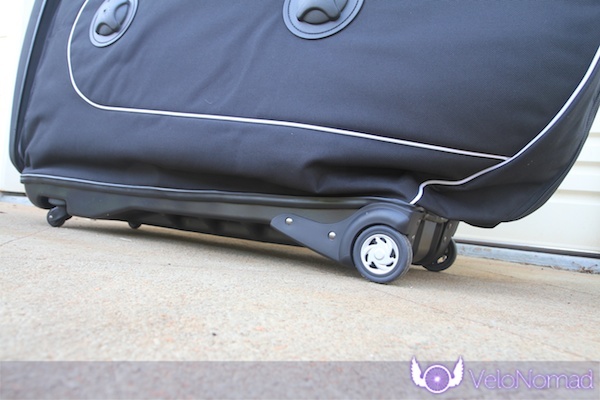 The castors appear a tiny bit flimsy but a few trips will reveal their longevity. 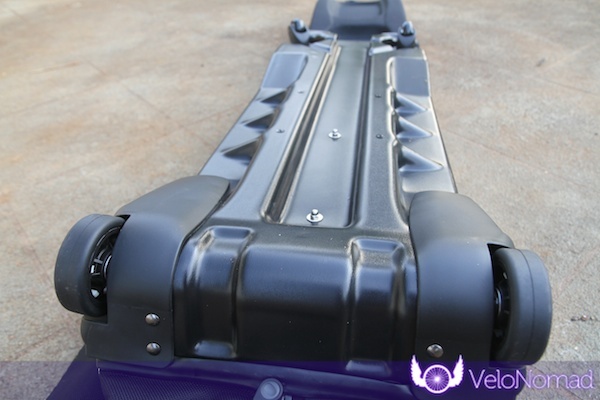 Because of the hard base and great construction, no material overhangs at the ends (unlike on the Scicon AeroComfort 2 TSA). Whilst the zips aren’t YKK, they seem adequate and the main compartment zips are large gauge. The main compartment zips have grab ties, which is awesome. The two small stash pocket zips do not have grab ties. This mightn’t seem like a big issue (and it’s not), but they’d make the bag just a tiny bit better. Internally, there is only really one strap – at the base to strap over the bottom bracket/down tube to hold the bike down. And you don’t need that many straps as the bag is quite compact and with the bike being packed snugly, lots of straps aren’t really needed. There are two external straps laterally across the bag that help compress it but also can be used to lift and steer the bag. The main front handle is tough, re-inforced and simply reeks quality. Protecting your bike is where the BikND really excels. 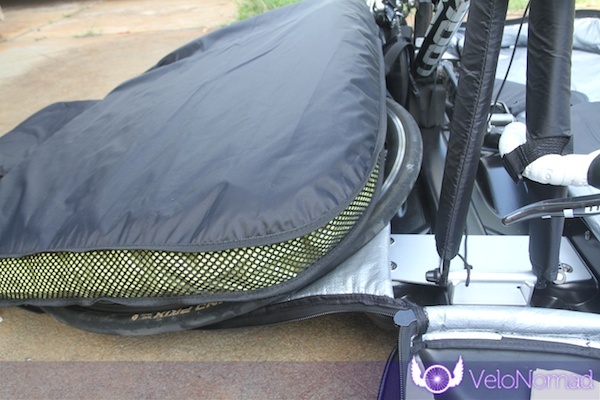 The air cushions ostensibly provide protection that other bike bags don’t. 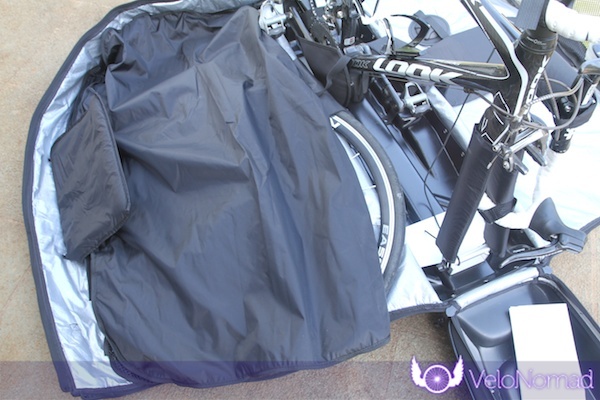 Here’s how this bag at excels at protecting your bike. 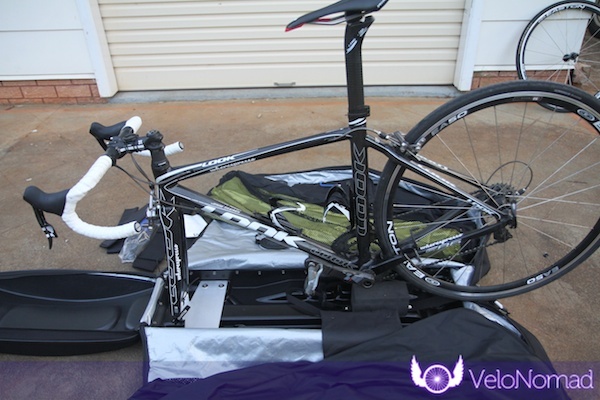 To further protect your bike, I’d add some bubble wrap, an old sheet or towel along the top of the bike. 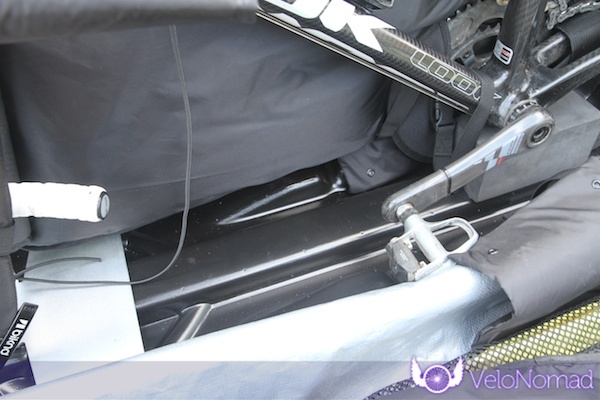 The BikND Helium will accommodate most bike sizes, unless you have an integrated seat post. I have an XS Look frame and it does not fit with the seat in situ. There is ample space to accommodate frames up to XL. Mountain bikes can also be fitted in the bag. 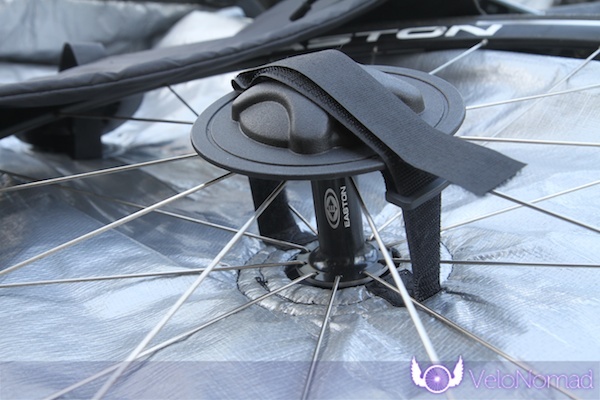 The rear bracing skewer is attached via a strap so it can accommodate a wide variety of bikes. 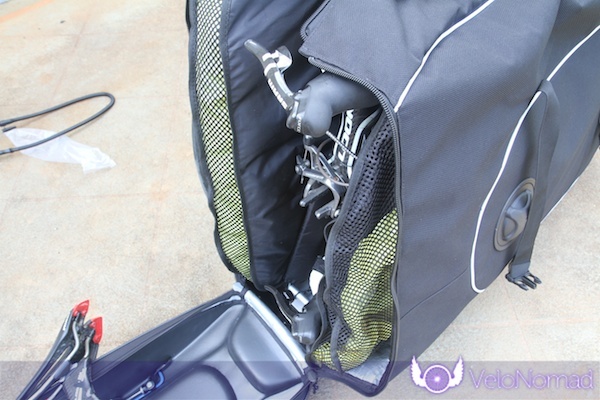 Once the bike is in place, there is ample space in this bag to store some of your gear. I’d be packing soft stuff like kit and clothing, in order to help protect the bike. There are two stash pockets accessible from the top of the bag which are good for some tools and the air bag pump and whatever else. Don’t put too much weight in them as they’re attached to the top of the bag by stitching. Note, the BikND will fit 4 – yes 4 – wheels. 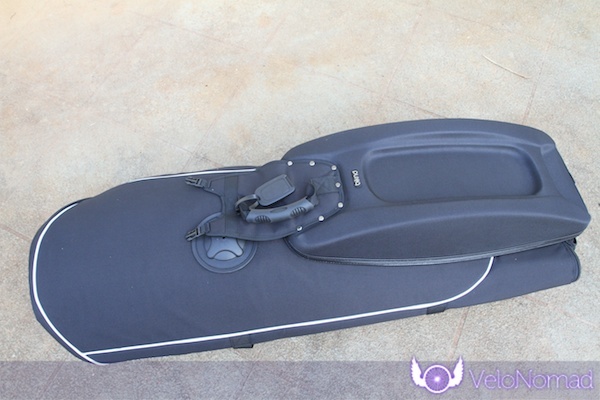 Given the padding provided by the air bags, you don’t need need a lot of internal straps. 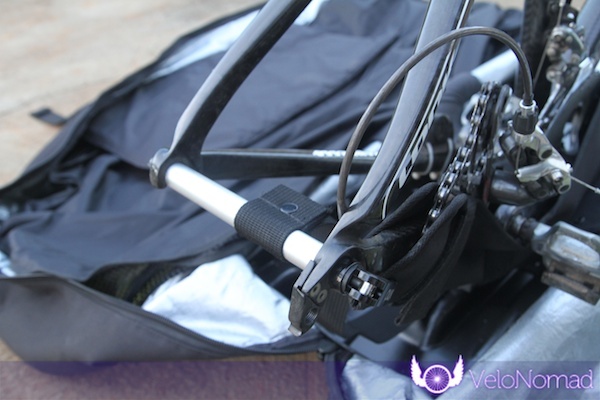 There is only one internal strap for securing the bike, at the bottom bracket/down stay area. And to be honest, this is all that is needed. 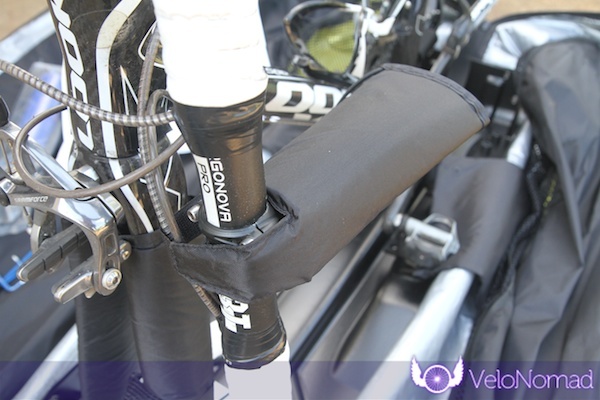 Two velcro straps are provided for securing the handlebars to the forks. The BikND is a pretty expensive bag for a soft bag. However, given it’s quality and practicalities, I think it provides excellent value for money. Expect to pay around AUD$600 (more from a retailer). 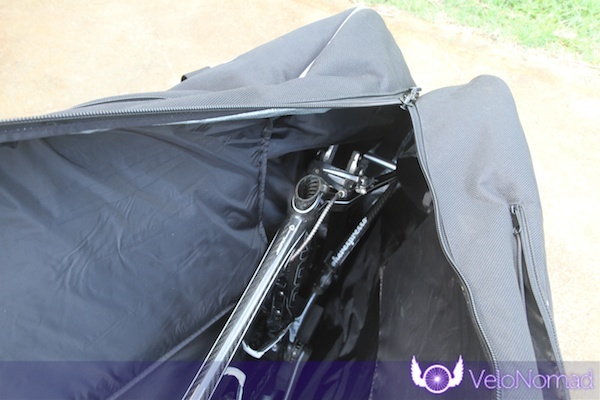 The BikND Helium does a stellar job of balancing the need for a lightweight, agile, compactable bag with something that is robust, practical and that protects your bike. As I mentioned at the start, I think it’s the best bag on the market. The scores are below. Remember these scores are subjective according to how I judge the bag. These scores might be important to you or they might mean nothing. Download my bike bag scoring spreadsheet to tweak the numbers yourself. 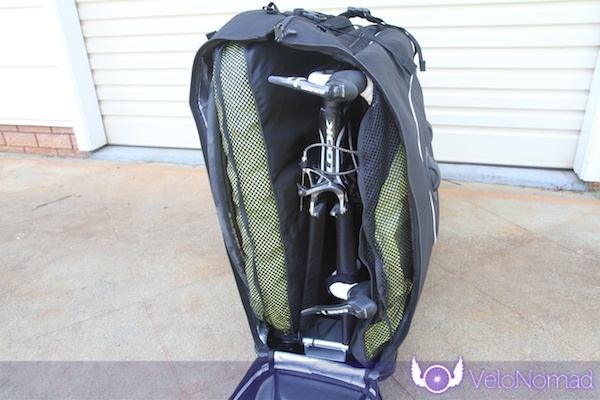 The BikND Helium Review has shown us that this is a very well designed, well constructed bike travel bag. In the soft bike bag market, it's probably the best or second best bag in the market. Highly recommended. 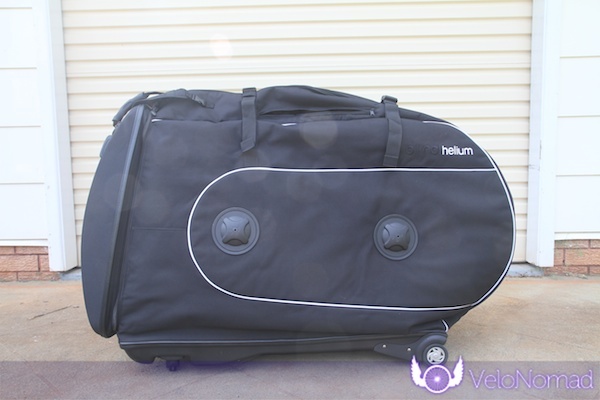 If you are not price conscious (or even if you are actually), fly with your bike a lot and want something that is going to last multiple trips, then I think this BikND Helium Review has made it clear this bag is for you. 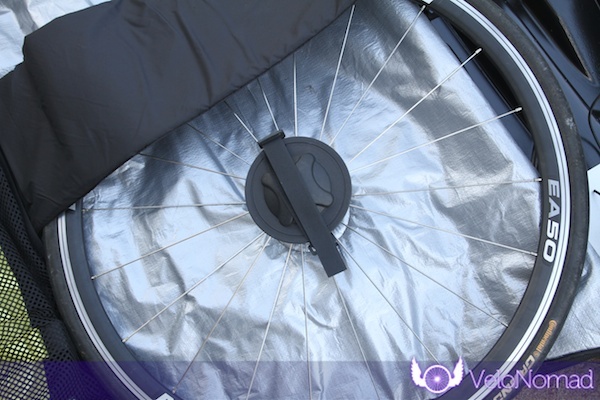 If price is more important to you than anything else the Chain Reaction Cycles bike bag might be for you. At time of publishing, there are are a few online retailers that sell the BikND Helium. Although Cell Bikes originally provided the BikND Helium for review for free, they no longer sell it! Tim, I lifted this bag at the LBS and it weighs a Tonne. The manufacturer stated its weight at 11Kgs, you sure its 9.5? Yep, tested on digital scales. Mileage might vary according to scales. In your “Summary and Overall Conclusion” above you state that “…Evoc does a stellar job…” and “… It’s best on the market…”. Just a point of clarification but were you actually referring to BikND? And I going to rate this review as 4/5 stars but my chubby fingers on an iPad resulted in 3 stars. I don’t have any experience with the B&W. 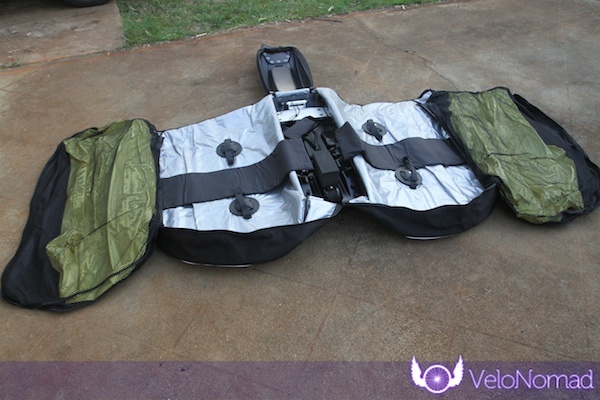 Have you had an opportunity to fly with the Helium case since you wrote the review? How did it hold up compared to the SciCon Comfort Plus? Have you experienced any issues with airport security deflating the bladders during inspection? I haven’t, no. But I personally would not pump up the bladders. I don’t think they’re needed. After packing my bike in there with all the other miscellaneous stuff, it was really well padded and protected. I’ve heard the TSA will deflate and leave them, but that’s the TSA. Euro customs would probably shrug and continue eating their croissant. wondering whether the BikeND could fit a DH bike with the 200mm travel fork? Hi Vin, probably yes. I don’t have the bag at the moment so can’t measure, sorry! quick question concerning frame size again. Which one is better for big road bike frames, this one or the Evoc. From BottomBracket till end of seat tube how long can it be? I have a semi integrated seat tube. BIKND says 64 cm Frames, but thats not very accurate, please advise. With the BikND bag, from the block that the BB sits on to the top, is bout 67-68cm. The EVOC might accommodate something larger as it started life as an MTB bag. If you end up getting one, would appreciate if you bought one through one of the links in the reviews. I am flying to Israel for a 5 day ride in the desert for charity. Any idea if I can check this in as regular luggage? or would the airline charge for oversized type handling? I know it varies by airline but what are your thoughts? I would have thought the airbags would be outside of everything, and not between the wheels and the frame. Seems to me that would protect the precious wheels a little better. Any idea of why it’s been designed the way it is? I’ve no idea Joachim. I can only assume that the assumption might be that one doesn’t take high end wheels overseas? 2015-09-29: It would be great if there was date on these reviews. Also, your links reference the wrong bags at the top of the review. And isn’t the Scicon your latest best and greatest? Thanks Stuart, I need to update the post. As you can appreciate, with hundreds of articles, maintaining them is not a trivial task. I have an Enviro BB to review, but I personally don’t rate them. Previous Post: Power meters for training – are they worth it?